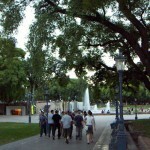 Yesterday I returned to the UK again after a short visit to Argentina, and am surprised not to see any snow. Since August, when I left for Cho Oyu in Tibet, it seems that barely a week has passed when I haven’t seen snow. On Cho Oyu, there was so much snow that virtually no one climbed the mountain due to the massive avalanche risk. I moved onto Baruntse in Nepal, where it was a similar story. I returned to the UK summitless, where it snowed some more. Needing to restore my pride by climbing something over Christmas where it was unlikely to snow, I first chose a mountain called Ojos del Salado in South America. Situated in the heart of Chile’s Atacama Desert, the driest place on Earth, it possessed the additional advantage of having a motorable road most of the way to the summit. 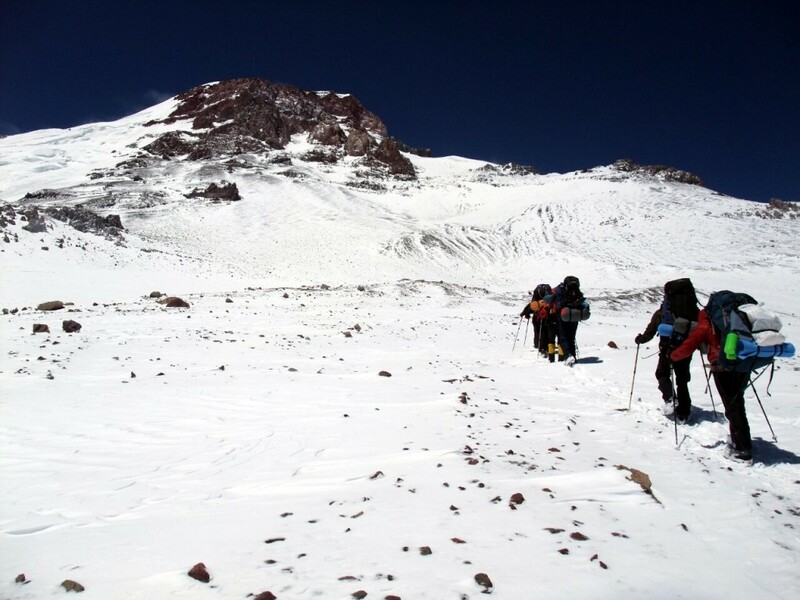 As far as easy summits with little risk of snow go, it has to be high on the list of contenders, but unfortunately the expedition I booked onto was cancelled, and I found myself back on 6959m Aconcagua, the highest peak in South America, and a mountain I first tried climbing exactly 5 years ago. Aconcagua during the heart of the Argentine summer, so they tell us, also carries little risk of heavy snow, but is certainly not an easy proposition to climb, for reasons I’ve outlined in an earlier post. So anyway, almost inevitably, on 29th December I found myself slogging my way up from Camp 2 to Colera Camp on the mountain’s False Polish Glacier Route in a heavy snow storm. “How much snow will it take before a summit attempt becomes impossible?” I asked our guide Augusto upon reaching camp. “Don’t worry, we’ll be OK,” he replied. Fortunately, the Augusto in question happened to be the Peruvian Augusto Ortega, working for the US mountaineering company Aventuras Patagonicas for the very first time. Not only has he climbed Aconcagua more times than anyone else (56), but he is also the man who discovered the False Polish Glacier Route, which has now become the mountain’s second most popular, and is certainly a whole lot more interesting than its most popular, the so-called Normal Route. 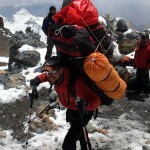 He is without a doubt one of the wisest and most experienced guides I’ve ever climbed with. Two days later, on 31 December, after eschewing our scheduled rest day and forcing another load carry to Colera Camp to take advantage of the most favourable summit window, Augusto and his assistant Leo led myself and five other clients to the summit in less than perfect weather conditions. That morning started perfectly, with very little wind and comparatively warm temperatures of -15C when we set out at 7.15am. Upon reaching The Traverse, where I had been turned around on my previous attempt, we found ourselves battling into the teeth of a blizzard and trudging upwards through a foot or two of very tiring fresh snow. Many other climbers passed us coming the other way, having given up on their own attempts, but Augusto kept going, and so did we. The Canaleta, a 300m stone chute which is the crux of the climb felt a little easier after we’d put on crampons, but at the top of this we again came across fresh snow, which this time nobody had yet been brave enough to break a trail through. This snow beneath the summit ridge had turned back a party attempting the summit the previous day, and another guide and his client were waiting here debating whether to try and cross this short traverse up to the summit themselves. Augusto, however, didn’t hesitate. With sticks in hand he stomped a trail and waved us across behind him. At 4pm I was the first person to stand on the summit for a couple of days, and it seems Augusto had even arranged a break in the clouds for us, so that we could look back along the summit ridge towards the south summit. As well as the guide and client we passed at the top of the Canaleta, three German climbers followed us up, and together we were the only 13 people to stand on the summit that day. 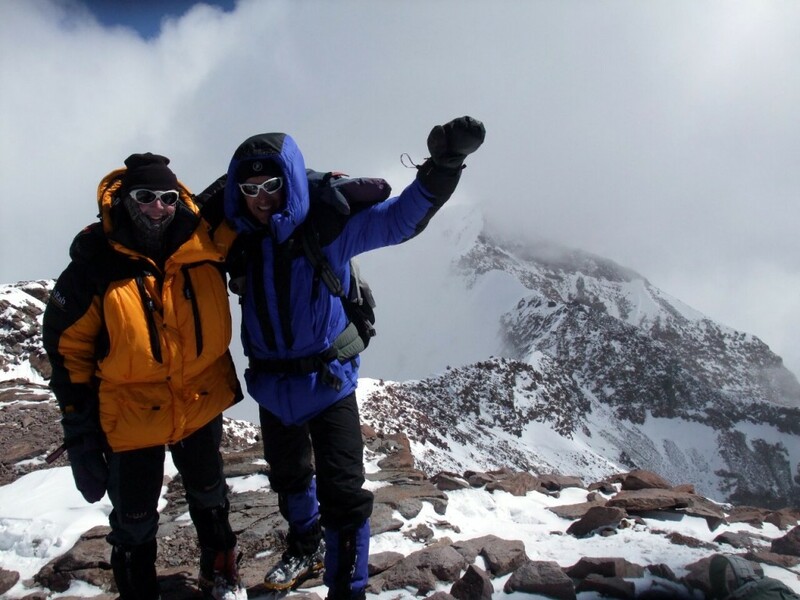 It had been hard work, one of my more tiring summits, perhaps because we’d preceded it with 3 days of heavy load carrying without a rest day, but also because the whole expedition had taken just 12 days from start to summit at nearly 7000m. Such quick ascending to very high altitude really takes it out of you. It had been a very happy experience, and a complete contrast to my previous attempt in 2005/6. On that occasion I had used the British mountaineering company Jagged Globe, whom I have been on a great many successful and enjoyable expeditions with and can thoroughly recommend. 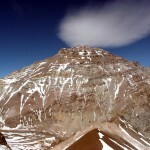 They are not, however, the best option for Aconcagua for at least two very good reasons. The first of these is that they only run expeditions on the Normal Route. With a walk in along many miles of flood plain in the Horcones Valley and a thousand metre featureless scree slope to stare at for days on end, this is possibly one of the most boring routes on any big mountain anywhere. By contrast the other side of the mountain, with the narrow Relinchos Valley broadening out into wide views of the Polish Glacier, and a climb above base camp involving many twists and turns, offers a much greater variety of scenery which at times is very beautiful. Secondly they do not employ the best local guides. Five years ago we were stunned when ours turned us around on summit day before we had encountered any great difficulty, and it is worth noting that the same guide was taking the Jagged Globe group up the Canaleta when we passed them on summit day this time around, but they were not among the climbers who followed Augusto’s comfortable trail to the summit. But for me, these frustrations no longer matter. I’m happy to have stood on top of the Southern Hemisphere’s highest point at last, and the memory will stay with me for a long time. Three cheers for Augusto – I hope I climb with him again sometime. …cada ascension es un sueno mas, ascender una montana fructufica el alma, mientras vivamos agasmoslo con las montanas. Great article, just one correction, Augusto Ortega has been with us already for some time and has done several Aconcagua trips with us! Thanks for the correction and good to hear from you. 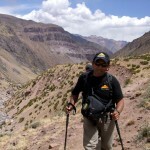 I thoroughly enjoyed the trip, as you can tell from the post, and can certainly recommend Aventuras Patagonicas for Aconcagua (and in fact I’ve already done so). Also worth mentioning is that it wasn’t just Augusto who was determined to get us to the top on summit day but assistant guide Leo Rasnik, who spurred the slower members of the team onward when they were thinking of turning back, something they were very happy about (though not till much later ;-)). Look forward to travelling again with AP in the future. Did anyone know Scott Dull from the 1990’s. I’d never thought to ask before but I’m his older sister. 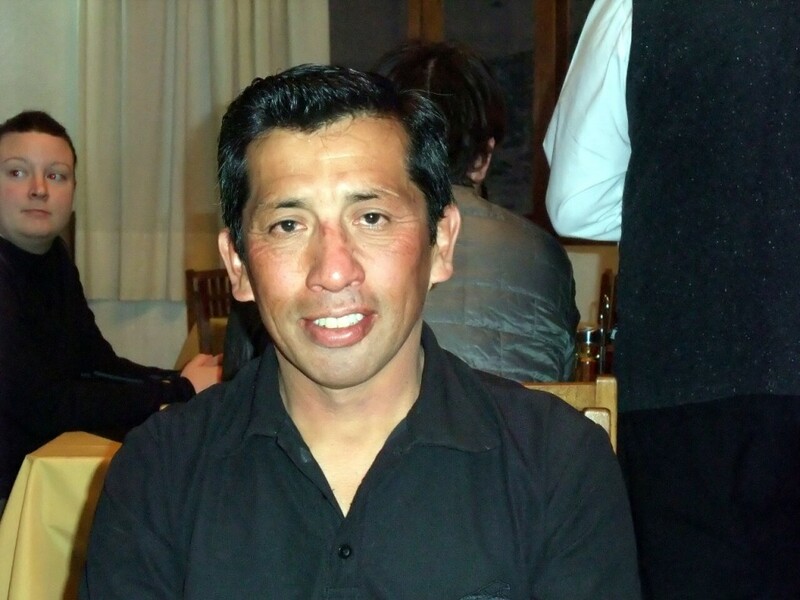 He summited acancagua in the 90’s and died in 2001 in a Utah avalanche. Any stories or friends or acquaintances of his would be refreshing. We still miss him so. I know he used a guide service. Many thanks.